The Coast Guard has become aware of certain Mustang Survival Inflatable PFDs with Hammar MA1 hydrostatic (HIT) inflation systems which may not inflate and require a new re-arm kit to properly inflate by manual or automatic activation. This safety alert identifies which products are affected. Certain inflatable PDFs may be subject to delayed or non-inflations. To determine if you are impacted please follow the instructions below. If you have a re-arm kit MA7214 or MA7218 you need only to check the lot number on the CO2 cylinder label. If your CO2 cylinder is marked with lot numbers 404121 or 404122 please contact Mustang Survival’s customer service group at the number below. If you have a PFD listed above refer to the sewn-in approval label to determine if it was “Made in Canada” and the “MFG DATE” is April or May 2012. If so, you will need to check the lot numbers of the CO2 cylinder. The CO2 cylinder lot number is visible through the yellow bladder fabric. 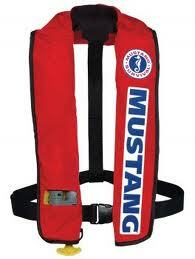 Manually unpack your PFD by opening the zippers and unfolding your PFD. Find the CO2 cylinder that is attached to the round inflator within the yellow bladder. Press the yellow bladder fabric against the cylinder to read the label to view the lot number through the fabric. If your CO2 cylinder is marked with lot numbers 404121 or 404122, please contact Mustang Survival’s customer service group for instructions and to arrange for a replacement inflator assembly. Additional information is available at www.mustangsurvival.com/HIT. Please note the following photographs. Photograph showing view of lot number through fabric. Lot number on cylinder label. This Safety Alert is provided for informational purposes and does not relieve any foreign or domestic requirement. Developed by the Lifesaving and Fire Safety Division, United States Coast Guard Headquarters, Washington, DC. For additional information contact Mr. Martin Jackson at Martin.L.Jackson@uscg.mil. The next big project will be the installation of an inboard generator. 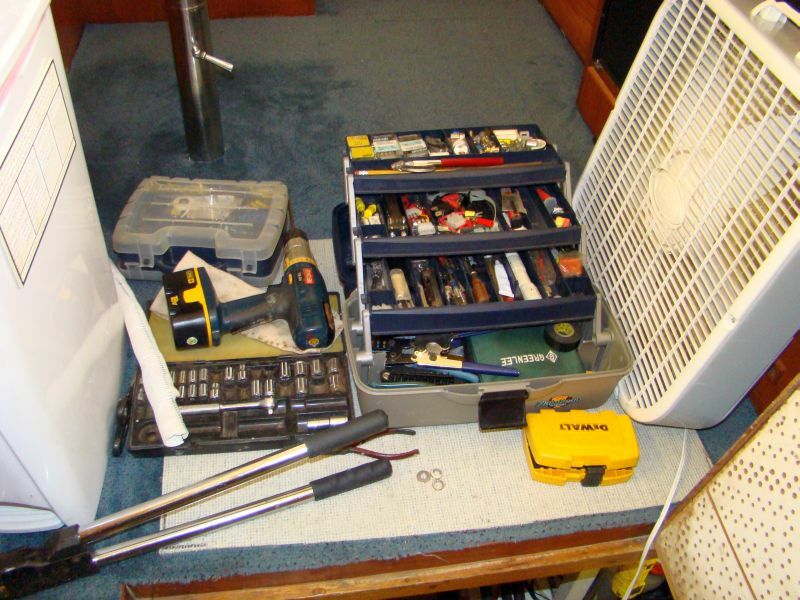 The engine compartment of a Marine Trader 34 is not known to be the roomiest, so a few modifications are needed to make space available. The most logical placement choice is a shelf on the port side forward where we installed the house battery bank when we first bought the boat. Even then, we knew they would eventually have to be moved to accommodate the generator. 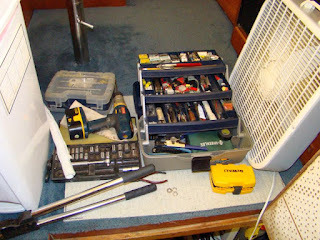 There was still some work to be done to clean up the wiring, so it was time to move the house bank and tidy things up.